The review is of the DTS-HD tracks. 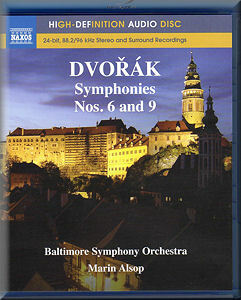 This is the second Blu-ray Audio foray by Naxos to land on my desk. Like the Corigliano Circus Maximus the cover plugs the high resolution of the master recordings used to author the issue. Also like the Corigliano the disc wants to be connected to the internet. Naxos inform me that this is a disc authoring matter that has slipped into production but is not required. So those playing this recording can accept or reject the invitation to connect. Neither option makes any difference whatever and be assured that Big Brother is not watching you if you say 'Yes'! Apart from this, playing Blu-ray Audio is simple and can be done without a display screen. The red button on your remote control selects DTS HD 5.1 and the green one selects PCM Stereo. A nice simple arrangement. I am pleased to report that the quality of sound on the red button is again absolutely top class. Whilst no one but an audiophile extremist would claim any recording sounds like the real thing, this is as real as one can wish for. I have never entered Baltimore's Meyerhoff concert hall but I hear a believable picture of the sound from about Row M in this rather beautiful auditorium. Since I like to sit closer in any concert hall I do find this recording a little distant but that is no criticism of the engineers who have made their decision and managed it extremely well. I was struck repeatedly by the feeling that this was like an excellent standard stereo CD with added space and a lack of nasty edges. If this is indeed a result of DTS HD 5.1 mastering then I think listeners will be happy. As to Marin Alsop's way with Dvorák I am less enthusiastic. She directs a performance of both the 6th and the 9th that I would characterise as smooth, lyrical and delicate. Nothing is misplaced and the orchestra plays very well indeed. Having attended many concerts conducted by Maestro Alsop with her ex-UK orchestra, the Bournemouth Symphony, of whom she was the principal conductor for several years and is now Conductor Emeritus, I recognise the same good and less good points. These are beautiful performances but lacking some drama. Tempi often seem just a notch too relaxed. Moments when the music seems to demand more rhythmic edge get instead more careful shaping. There is much to enjoy in both symphonies but I find more in the classic Kertesz recordings and in the New World particularly I find Wolfgang Sawallisch's ancient recording with the Philharmonia (1960) has drama, depth and all round sparkle that this lacks. However, no other performances are likely to be better recorded than these and they can be recommended with slightly muted enthusiasm.